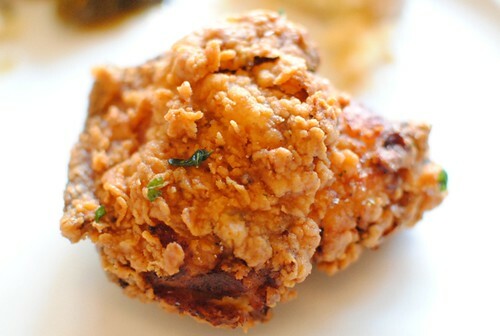 Thomas Keller’s fried chicken is one of the most memorable dishes I’ve ever eaten. 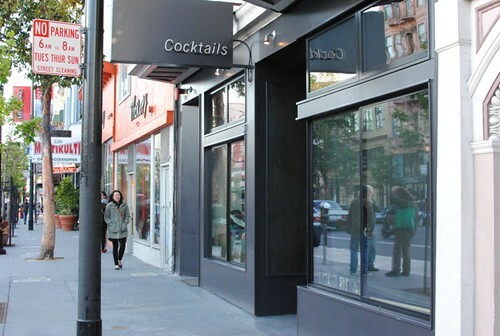 I had carefully planned a trip to Ad Hoc and came in with very high expectations. 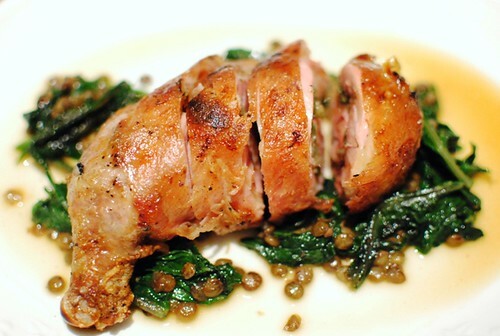 The crispy crust and juicy, flavorful bird did not disappoint at all. 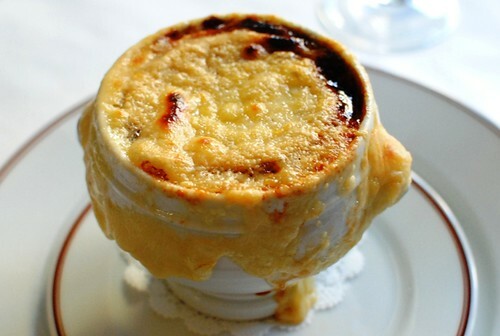 Served just once every two weeks at Ad Hoc in Yountville, it’s not something I can enjoy with any regularity. It is possible to make it in the convenience of one’s own home, but the whole process takes a while and is pretty labor intensive. While the results are delicious, I don’t think I’m making it again anytime soon. Given all this, I was super excited to hear that Bouchon Beverly Hills would be serving this very chicken on Memorial Day. Served family-style, the chicken came with a few sides (biscuits & gravy, collard greens, and macaroni & cheese). This was their first time serving it here, but given its popularity, I have a feeling it won’t be the last. The soup was very rich, almost syrupy at times. The flavors were deep and beefy with a nice sweetness from the onions. I would’ve preferred this to be a little lighter though, for a starter. 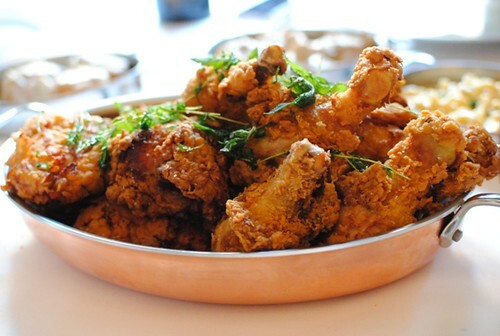 The fried chicken arrived just as it does at Ad Hoc, in a stainless steel serving platter covered with fried herbs. A beautiful sight. The dark golden crust is the same as I remembered, light yet very crispy. The meat was flavorful, though I remember it being a little more moist. Not that it was dry at all, but previous experiences have yielded a surprisingly juicy bird. Still, excellent fried chicken – some of the best I’ve had in the city. 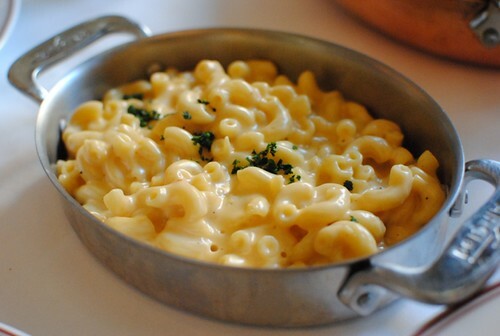 The macaroni pasta was still slightly al dente, which I enjoyed, while the cheese sauce was good. I thought this singular side was kind of small to share family style for six people, though. 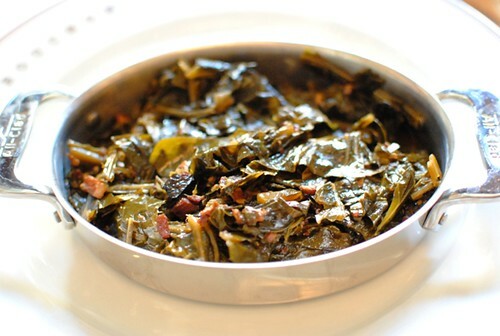 As expected, the collard greens were cooked to the point that there was no resistance. I think there was some bacon or ham in here too, adding some saltiness and subtle pork flavor. Again, also rather small to share with six people. The biscuit was a little more dense than I would’ve liked, but the flavor was there. Especially with the rich and meaty gravy, these were a hit. We passed on dessert at Bouchon, instead opting to drop by a local ice cream shop for some ice cream as they were closing. 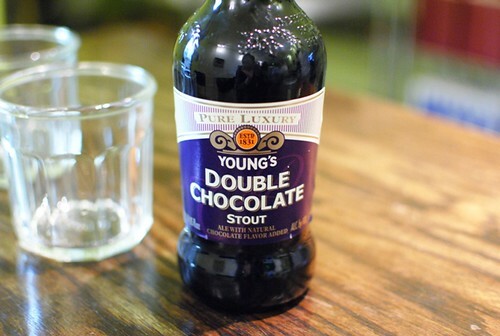 I had some Young’s Double Chocolate Stout on hand, which would pair nicely as a beer float – here with three different ice cream flavors (vanilla bean, almond mocha, brown bread). All three of these worked pretty well, with the classic vanilla bean combo being my favorite. Service-wise, there was a large disconnect on this night between what we ordered and what actually came out of the kitchen. I’ve been here a number of times without a hitch, so I think that was just a fluke. 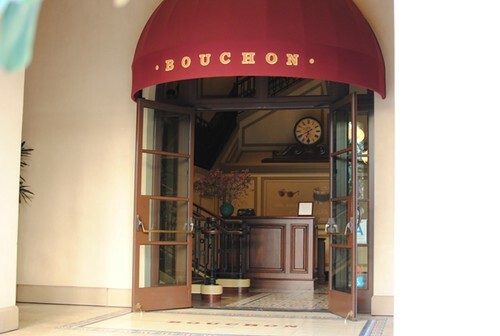 I’ve been a fan of Bouchon since it opened, and the fried chicken just gives another reason to come back. In fact, I think it definitely proves worthy of a return trip alone. 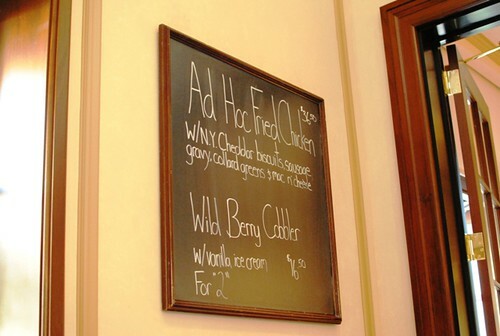 Of course, that’s only if they bring it back as a recurring special, but my hunch is that we haven’t seen the last of Ad Hoc’s fried chicken here. 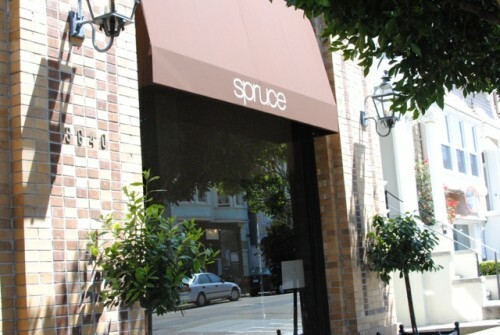 Spruce opened in 2007 to high praise and a lot of attention, being one of the hardest reservations for a while. Almost 4 years later, the buzz has certainly calmed. 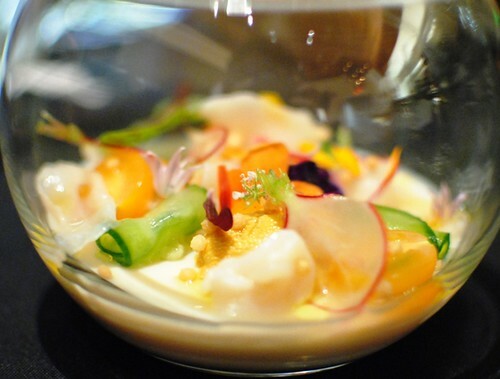 However it remains a a very popular spot, even garnering a Michelin star in the 2011 guide. Their most famous dish is likely the “Spruce Burger” which is listed in many publications as one of the top burgers (or dishes, period) in San Francisco. I happened to be working in San Francisco’s Laurel Heights on this day, so it was a perfect opportunity to come by and try this burger. 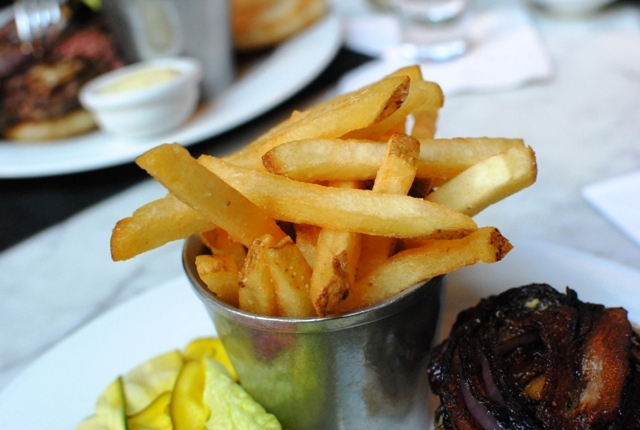 The burger, at its simplest, includes a bun, patty, choice of cheese, pickles, lettuce, tomato and side of fries. 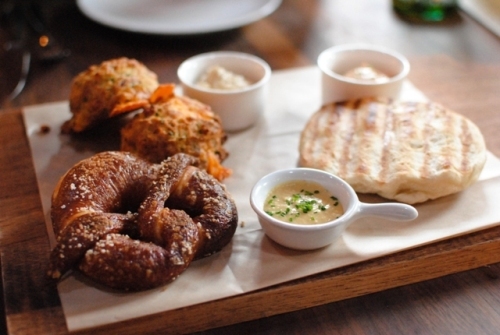 A variety of add-ons are available including bacon, a fried egg, mushrooms, caramelized onions and even foie gras. 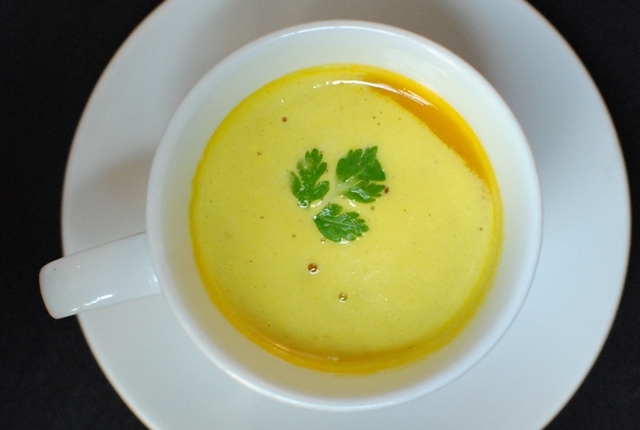 Looking like a cappuccino, the carrot soup was comforting, and not overly sweet nor overly carrot-y. 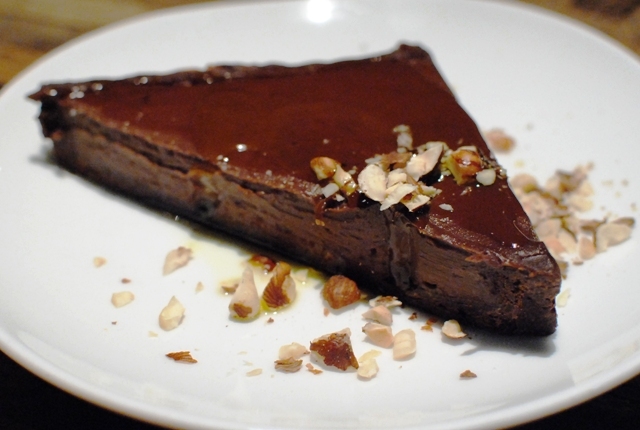 I appreciated the subtle nuttiness and sweetness from the almonds and dates, respectively. Now, what we came for! I first noticed the bun. It was relatively thinner and denser than what’s normally seen, with a well-toasted texture…I think it was pretty much like an English Muffin. 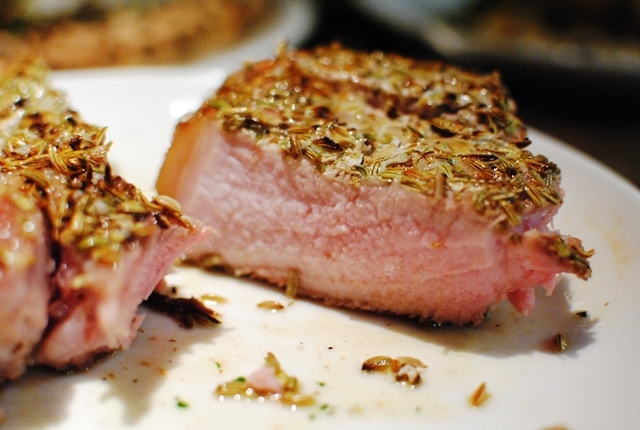 The meat (Niman Ranch chuck) was cooked a nice medium rare and oozed fat and juices when squeezed. The meat was tasty and the bun did a good job of soaking up the juices. 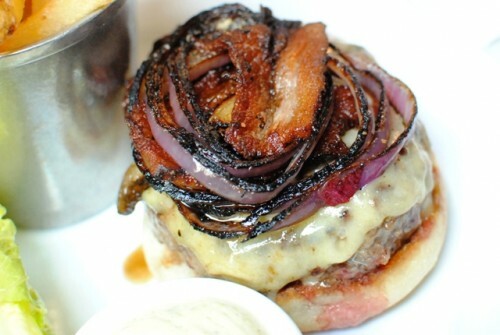 I opted to add on bacon and caramelized onions; I’d have to say both of these were very good and added a lot of flavor. It all came together really nicely; easily one of the better burgers I’ve had in some time. At $16, it’s not the cheapest of burgers, but the quality is apparent. 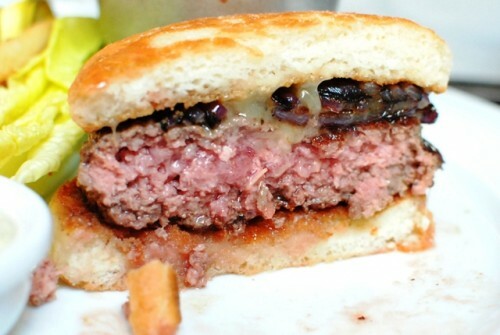 It’s a relatively simple burger, but the execution is key. I think each of the components were tasty on their own, but really came together to pack a load of flavor. The fries (which came with the burger) were quite good as well, with a delightful crunch on the outside and fluffy potato on the inside. There’s a whole rest of the menu that I haven’t tried yet, but if this burger is any indication, I expect it to be well-executed, carefully crafted and probably pretty tasty. The burger alone, though, is enough reason for a return visit. 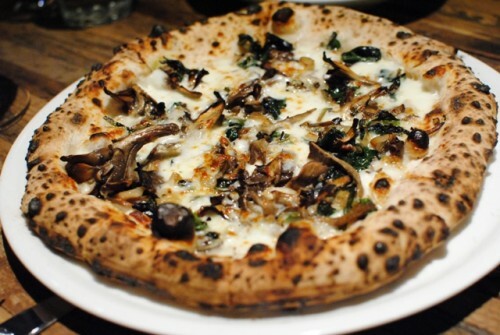 Locanda is the latest creation from Craig and Annie Stoll (the couple that brought us Delfina and Pizzeria Delfina), opened just three weeks ago. I’m a fan of both of the previous restaurants, so this was a must-try on my list. 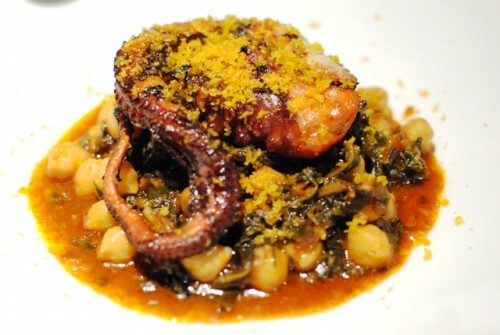 Both of the Stoll’s restaurants are Italian; the focus here is on the cuisine of Rome. 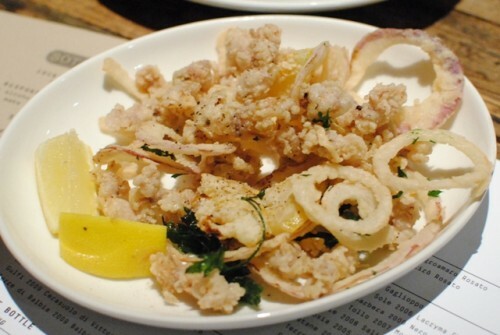 Pastas and charcoal grilled items make up the bulk of the menu, with a number of intriguing offal options. I had a flight to catch that evening, but was lucky enough to snag an early 5:30 reservation. Finding the restaurant can be a little tricky; the exterior signage is a plain black sign that says “cocktails.” However, there are letters in the bottom of the window that spell out “Locanda.” My mother and I opted to split one appetizer and one entree, as well as a few pastas. 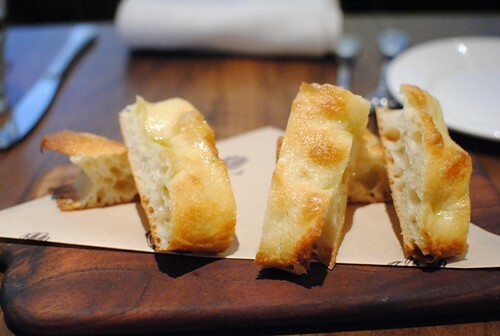 We were first served the house bread (kind of similar to a foccacia), topped with olive oil and sea salt. 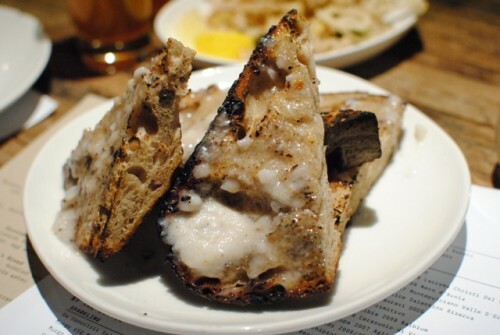 The bread had a nice chew, with just enough oil and salt to keep things interesting. Now this was fun. 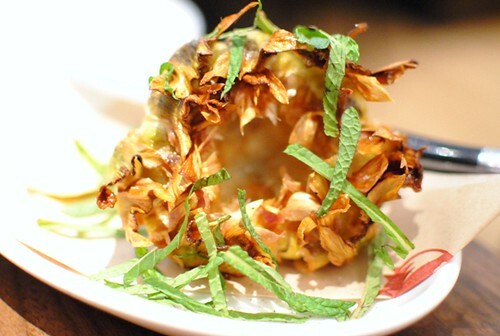 Apparently this is a classic dish from the Jewish area of Rome – an artichoke deep fried and topped with mint. The interior was meaty and the exterior crispy, quite tasty. 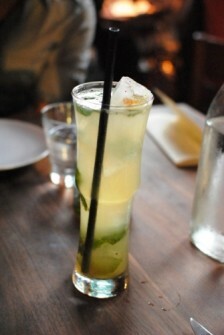 I liked the mint, which added just a little bit of brightness to the dish; a lemon wedge added some welcome acidity. I thought this was a very good version of the classic. Expectantly so, the pasta was perfectly cooked, leaving just a bit of chew to the pasta. The guanciale (cured pork cheek) imparted a little richness and hint of pork flavor, while there was just a little bit of spiciness that crept up on the palate. It was borderline too spicy for my mother, but I found it just right. Excellent dish. 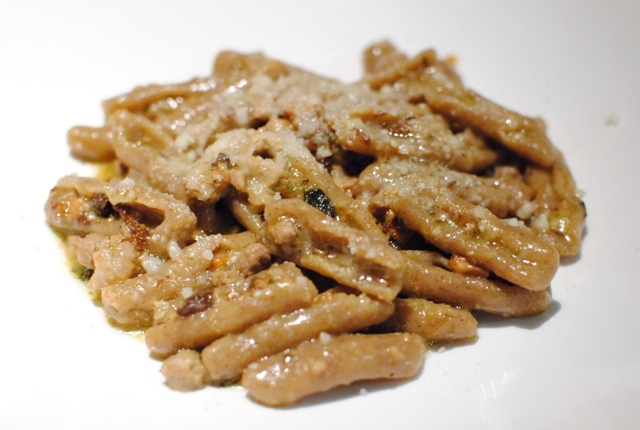 I really liked the radiator-shaped pasta as it clung to the ragu so well. 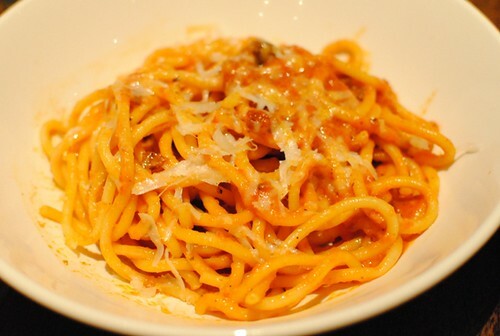 The pasta almost had a spongy texture because it had so much sauce, and really made for some good bites. 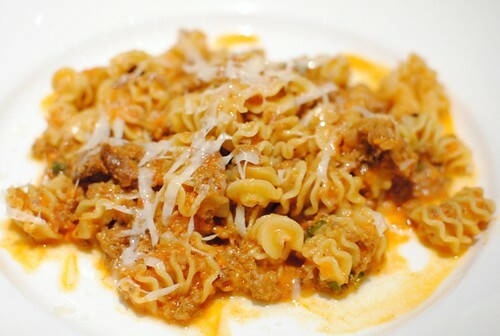 The ragu was rich and meaty, and I thought the cheese added some nice flavor too. 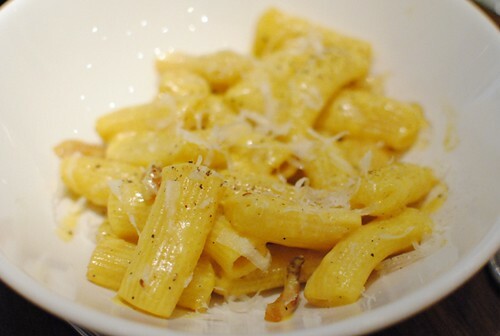 I liked the rigatoni’s chew and subtle flavors of the egg and pecorino, but I found this pasta to be a little bit less exciting than the previous two. Still, a good rendition of the carbonara. 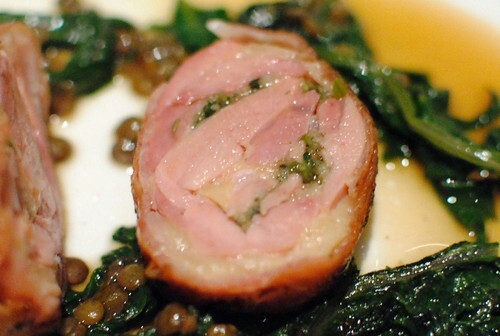 A guinea hen leg was deboned, then wrapped in spices, lardo and proscuitto. Sounds good? It was delicious. Really tender and moist with exceptional flavor. The skin was crisped up really well too, and the meaty flavors were balanced well with some bitter greens and lentils. Probably my favorite dish of the night. The cake was warm and really soft, with an almost pudding-like interior. 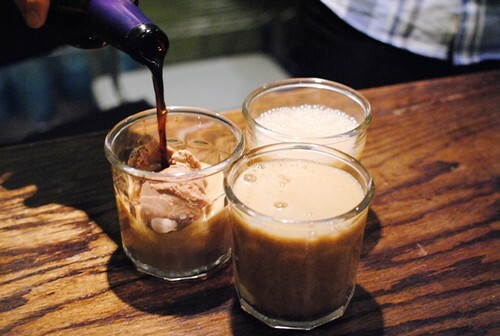 I liked the extra depth of flavor from the maple syrup, as well as the contrast of the whipped cream. 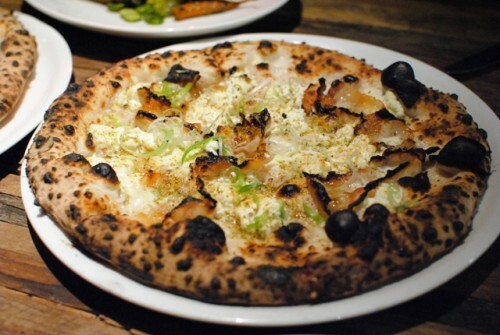 Locanda met my expectations (which were high, given the pedigree and buzz). 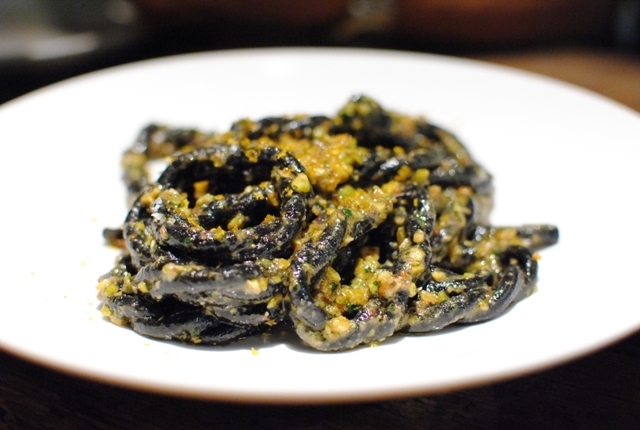 I found the meal somewhat similar in style to one I recently had at Cotogna, but I think I’d give a slight edge to Locanda (though, I tried a limited number of items at both). I thought the pastas were very good, and the only entree we tried was a memorable one. I look forward to trying more of the menu items sometime soon. M.B. 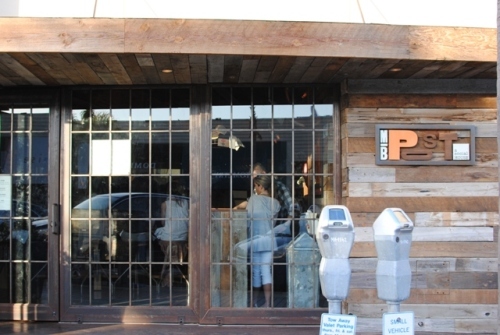 Post opened one month ago, one of the more highly publicized restaurant openings in the Beach Cities area. 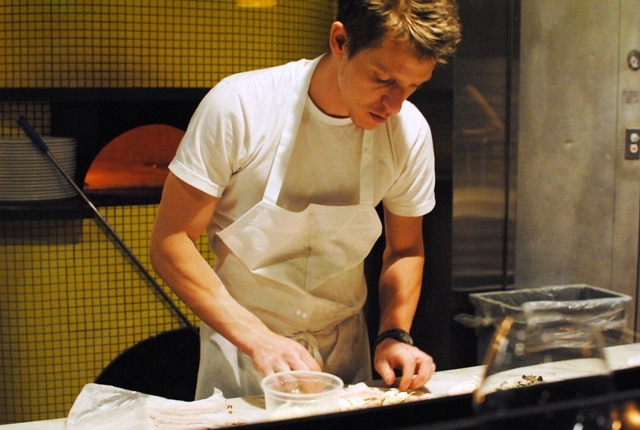 The chef is David LeFevre, formerly of the one Michelin-starred Water Grill downtown. 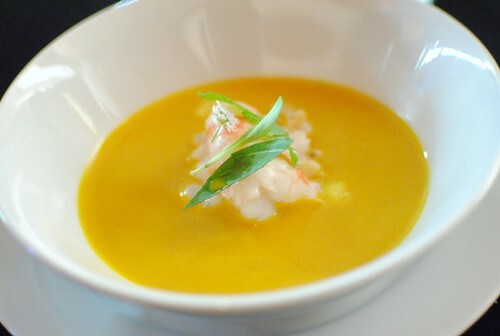 The concept here is very different; instead of the super-refined, seafood-centric fare of Water Grill, the menu here is more comfortable and balanced, showcasing seasonal ingredients and bold flavors in a “social house” atmosphere. The GM put it well, saying “David finally gets to cook what he likes to eat.” Clearly he’s on to something; this place was packed on a Wednesday night. 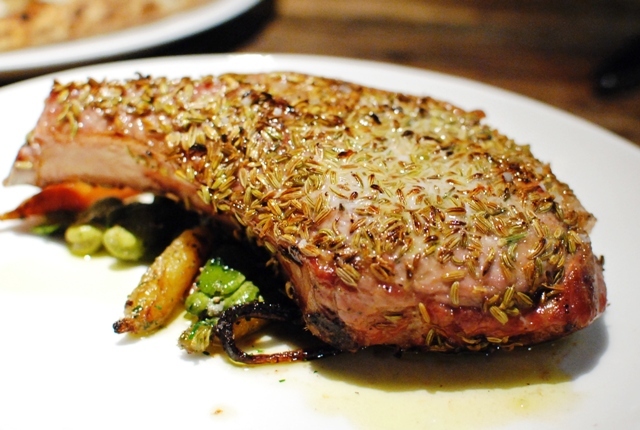 I had been interested in trying this place since it opened; however had not made it out to Manhattan Beach area yet. 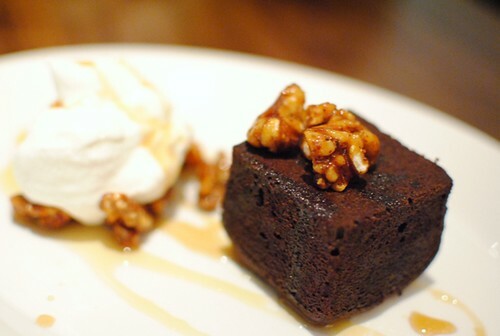 When I was invited to come take the menu for a spin, it was the “gentle nudge” I needed. We opted to allow Chef LeFevre full rein to choose some dishes for us. Meanwhile, we started with two cocktails. 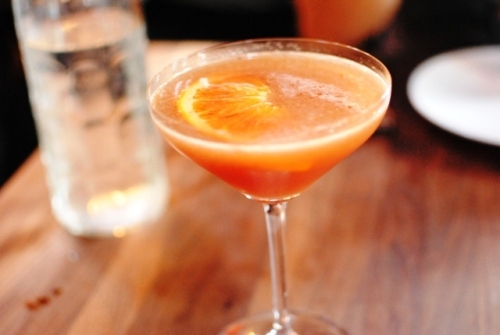 This cocktail had citrus notes up front, while the scotch was more noticeable on the finish. I thought this sounded too interesting not to try. It was pretty much like a mojito, but with Asian accents from ginger and coriander. Pretty good. I’m just glad there wasn’t any raw beef involved. Next up were a trio of breads with their own spread. All three of these were tasty, served warm, with the biscuits probably being my favorite. 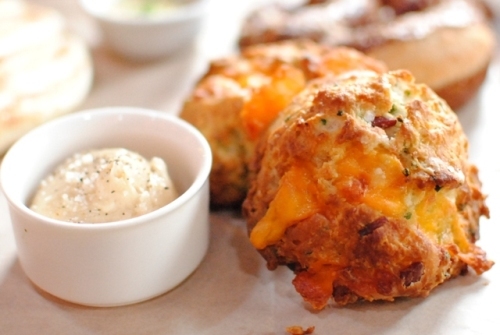 Bacon and cheddar flavors permeated the dough, which was moist and fluffy. The maple butter presented a delightful sweet counterpoint. 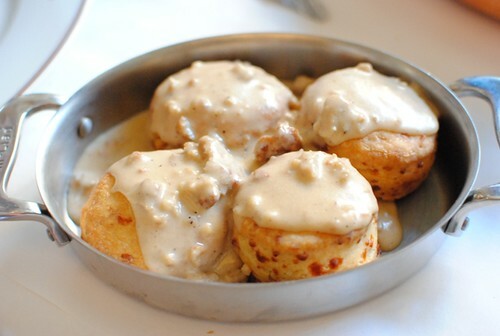 I wish I could somehow get this for breakfast. 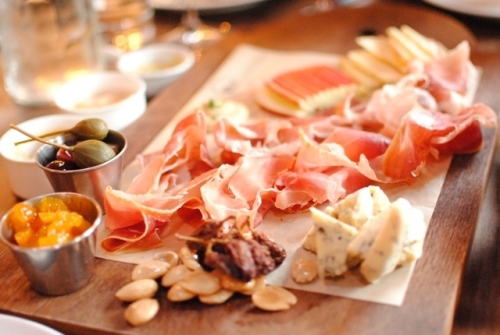 A large assortment of cured meats, cheese and accompaniments was served next. A little bit overkill for a party of two, I was glad to be able to try a selection of things. I liked both the serrano ham and the prosciutto, while the cheeses were complemented by a really impressive array of honeys. 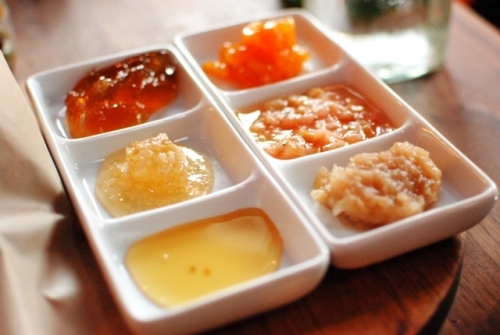 I don’t remember what all of them were, but they each had a distinctive flavor and sweetness – really cool. 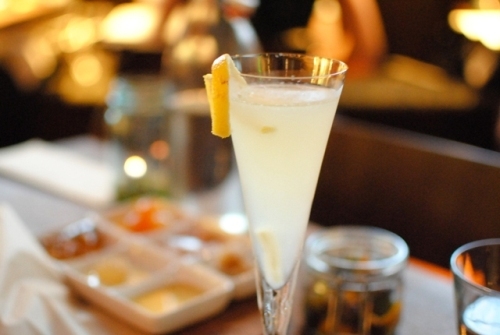 This cocktail had citrus overtones from the lemon, mellowing out the gin, with just a touch of licorice flavor from the absinthe. 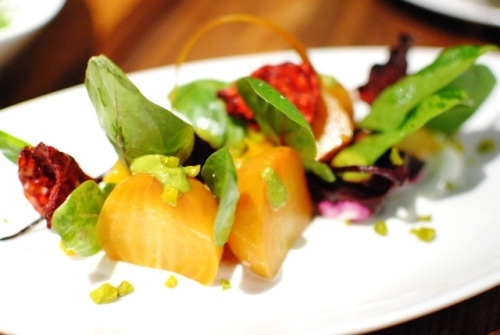 This dish screamed ‘summer,’ centered around a sweet yellow peach. The grilling really brought out the sweetness, which was countered by the bitter arugula. 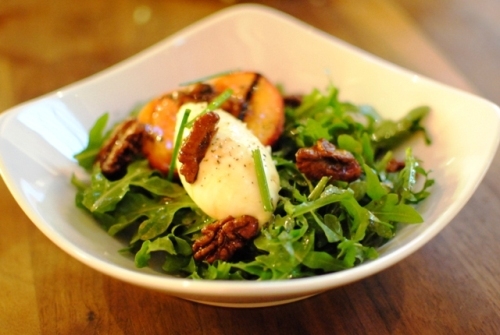 Whipped ricotta added some richness to the dish, while walnuts provided the crunch. The beets were surprisingly sweet, really refreshing. I liked the pesto as well, adding a bright vibrant flavor, while the pistachios added some texture. This was one of our most highly anticipated items and it did not disappoint. 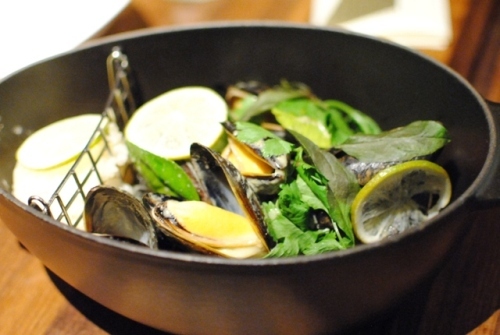 The plump mussels were cooked well, accented by a light and milky thai curry. Some sausage added salt and meatiness, while the sticky rice was very good. 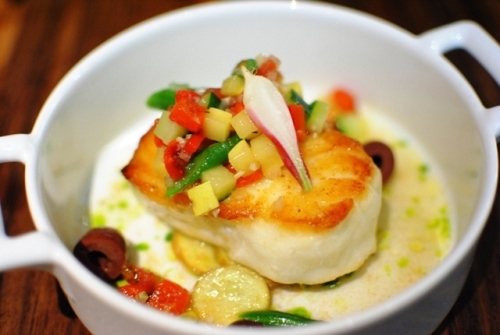 The halibut was beautifully prepared with a crispy sear and moist flaky interior. Some summer vegetables were a nice accompaniment, while the vinaigrette provided just enough acidity. We’d probably had enough food at this point, but it was on to the richer meat courses. 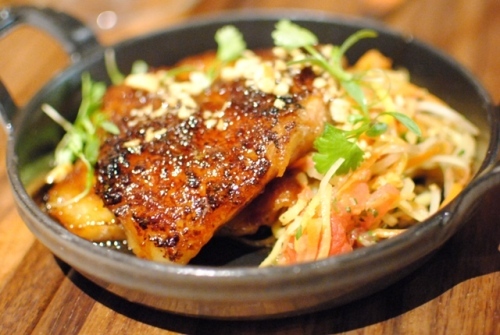 I can’t remember the last time I had pork jowl (cheek), but it had a rich fattiness like pork belly. I found the pork to be a little bit too sweet for me (especially with the richness of the fat), though the green papaya salad did help to cut through much of that. 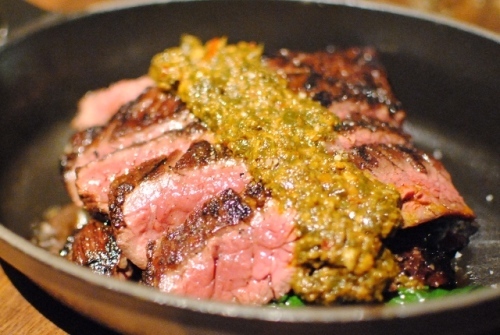 Hard to go wrong with a nicely cooked skirt steak. The grilling imbued a strong smokiness to this tender cut, while I appreciated the chimichurri for adding an extra flavor profile. 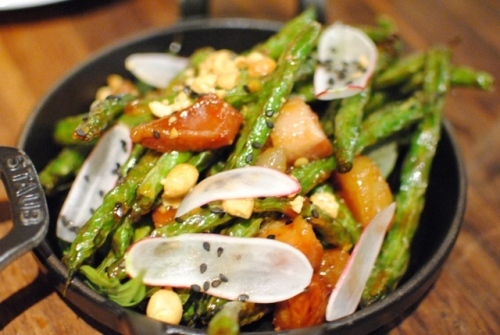 As a side, we had some green beans which brought with them quite a bit of heat, balanced by some radishes. The crispy pork was a nice touch. 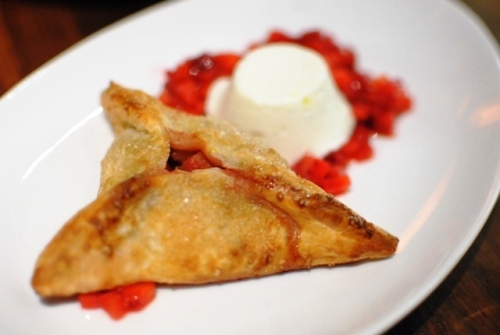 Here we had a light pastry filled with a sweet fruit. 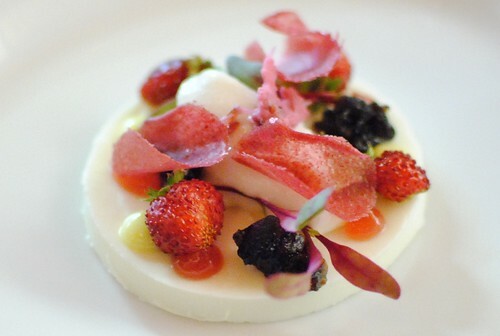 To balance this out, the slightly tart buttermilk panna cotta was smooth and rich, quite tasty. I thought this was a pretty solid chocolate cake. Not particularly memorable (there are so many chocolate cake variations out there now), but executed well. 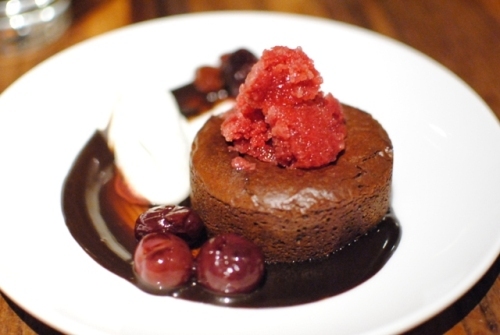 The tartness of the cherry granité nicely balanced the sweetness of the chocolate and vanilla. I enjoyed this cheesecake; the lemon was the standout ingredient for me here. I liked the streusel and almonds as well, adding some sweetness and texture. The apricots were a nice touch. This was a very good meal (and large; I think we easily had enough food for four). The menu has a lot of options and it was all done pretty well, from the bread to dessert. 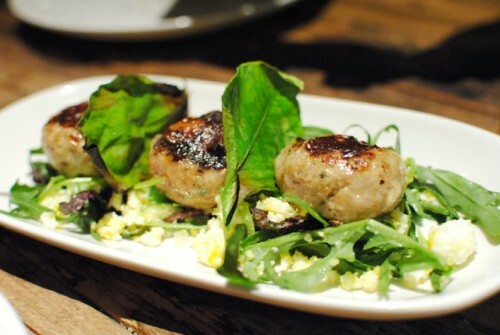 Whereas some of Water Grill’s cuisine can seem inaccessible or stuffy for some, MB Post prepared plates filled with familiar, yet engaging flavors – exactly what I think LeFevre was aiming for. I could see why this place was so popular, and I expect MB Post to continue to be a hot spot for both good food and drink. This was one of my most anticipated meals in recent memory. Urasawa. Cimarusti. Manzke. Three of my favorite chefs in one place?! No way! 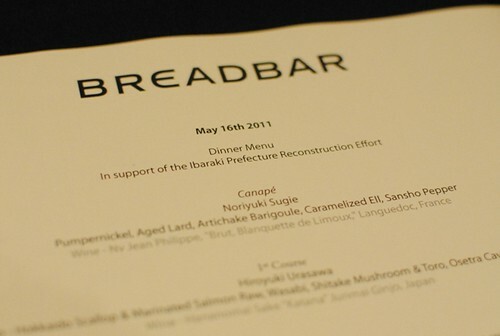 Breadbar and Comme Ça teamed up to feature two benefit dinners with 100% of the proceeds going to Japan earthquake/tsunami aid. 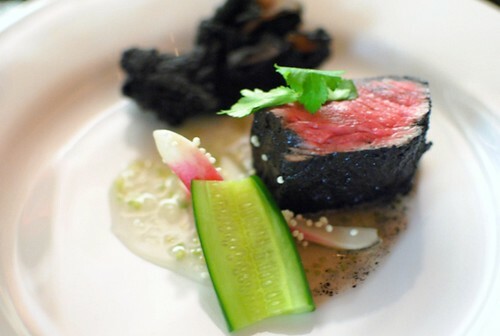 It was set up as a collaborative meal with 6 courses, each prepared by a different chef. 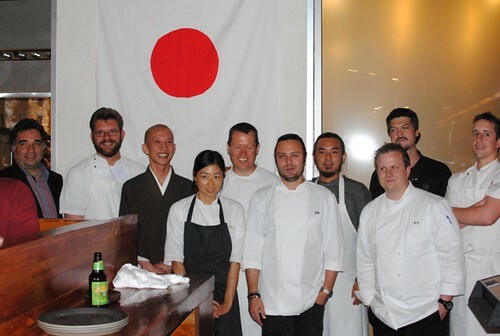 The impressive lineup consisted of Noriyuki Sugie (Breadbar), Hiroyuki Urasawa (Urasawa), Michael Cimarusti (Providence) Walter Manzke (formerly Church & State, currently popping up), David Myers (Comme Ça) and pastry chef Ramon Perez (Sona). Appropriately, the menu was strongly Japanese-influenced. Needless to say, I was super excited for this meal – great chefs, great cause. Joining me were Diana and Kristen, as well as Daniel (effing dericious), Christina (food, je t’aime) and Danny (Kung Food Panda). First up was a selection of breads. 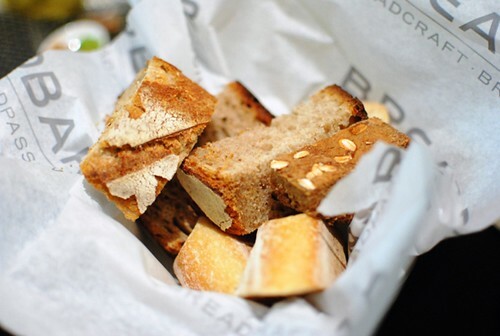 For a place called Breadbar, I’ve never been impressed with the bread. We started pretty strong here with a trio of bites. 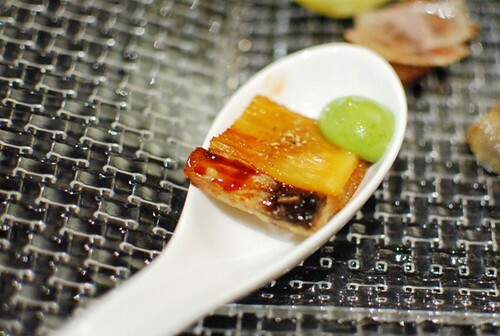 I first had the eel with pineapple – sweet and savory. The pumpernickel with aged lard really reminded me of Chinese sausage…which I thought was just really weird, in a good way. 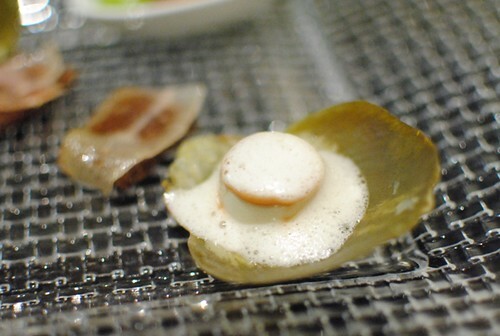 Lastly, the artichoke barigoule was cool and refreshing, in a way, with a light artichoke flavor. For a number of reasons, this was my most anticipated dish of the night. Hiro Urasawa never does events like this, so this was a most opportune time to try some of his food without dropping half a grand. 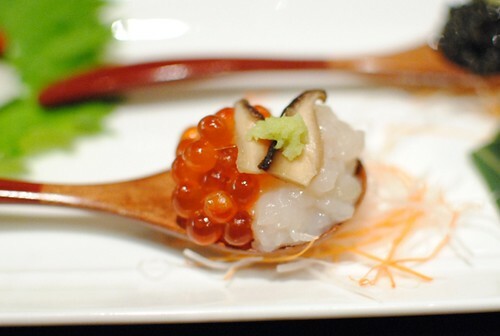 The scallop/salmon roe combination was cool and had good flavor, though there was something in there with a mushy texture. 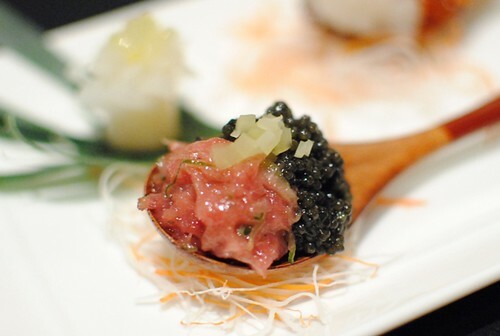 I liked the toro/caviar combination even better – savory and salty, rich yet light, very good. 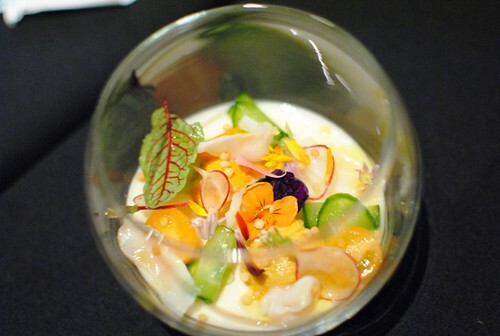 This was one of the most beautiful dishes I’ve seen in recent memory…and it tasted as good as it looked. 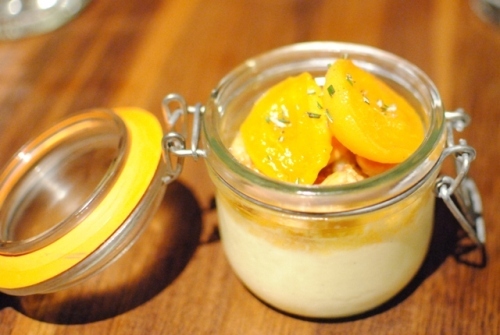 The soymilk panna cotta was silky smooth with just the right amount of soy flavor. Both the uni and geoduck were cool and tasty, not fishy at all. Finally, some cucumber and Japanese puffed rice added some texture. One of the best overall plates I’ve had in a while. I’m a huge fan of Manzke and can’t wait until he finally opens a permanent restaurant. The prawn was so delicate here, cooked perfectly leaving a soft and supple piece of fish. 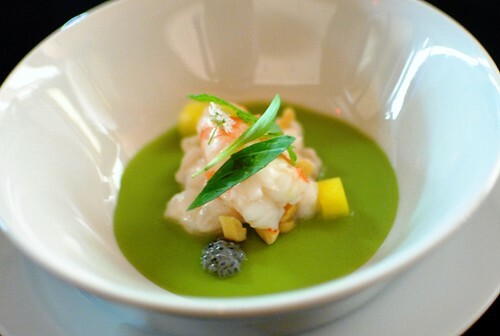 A little bit of lemongrass was an excellent accompaniment to the shrimp, and I liked the creamy Thai curry as well. This dish looked burnt when it came out. Like it was stuck in someone’s chimney for the duration of a cold winter. 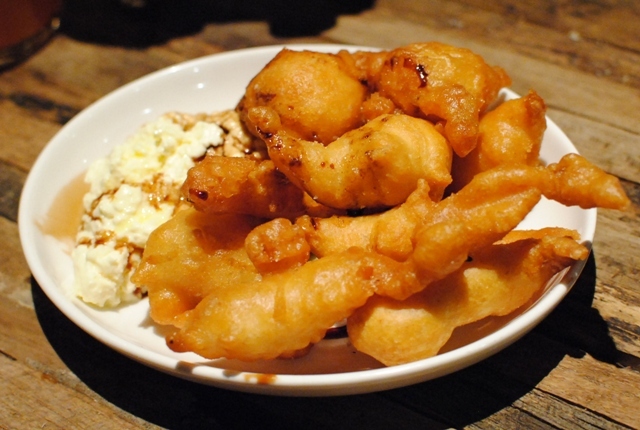 This was on purpose, but I’m not sure I enjoyed the charcoal maitake tempura. Mushroom flavor was present, but it was really, really crispy and broke apart. The meat was good but not really anything special. Dessert was outstanding. I’m not really sure how this was done. The base was sort of a gelatin/custard hybrid. Sweet but not too sweet, with bright fresh fruit flavor and floral accents from the cherry blossoms. These were pretty good. 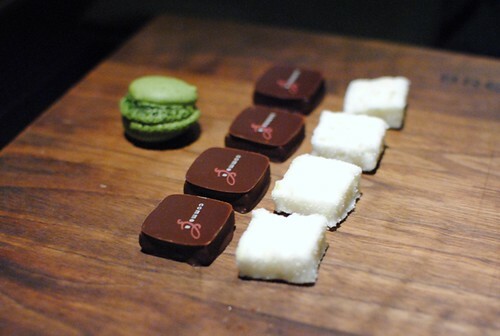 I liked the mini macarons best – good matcha tea flavor. I found this to be a rather strong meal. I was really excited about this one, but tried to temper expectations knowing that one-night collaborative dinners such as this one are often not as strong as the lineup would suggest. I had no disappointments here, really. Good food, good company, and a good cause – you can’t beat that.